Thanks to Wella Bloggers Meet!! On 28th Sept, I went to Select City Walk, Saket to attend the meet and while exploring MAC, I got this cutie pie and could not resist buying it. In fact, I went there to buy MAC Matt Bronzer but that was unavailable so I started exploring products. I got to try this awesome shade from MAC. I fell in love with it instantly and bought it. This is a very pretty orangish-brickish –red shade. It suits Indian skin tones well. It is from their permanent collection. 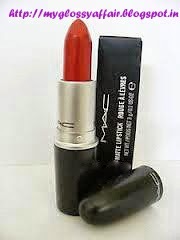 Like all MAC lipsticks, it stays and stays, and very richly pigmented. Those who don’t dare REDS can attempt this beautiful rusty colour true to its name, CHILI J. A single wipe of this very pigmented colour is enough but you can always swipe it 2-3 times to get that intense look or dab it lightly to get a stained look, upto your mood completely J. It stays long, for approx 6-7 hours surviving meals and goes evenly without leaving any patches. It transfers onto objects to some extent but on lips, it looks as even. It might feather a bit but when applied with lip liner, no such feathering occurs. It is a matt shade from MAC but feels so creamy when applying. No dryness occurs at that time or even after. I don’t feel the need for any extra moisturization on my lips with MAC Chili. All in all, this is a bold colour without the usual. 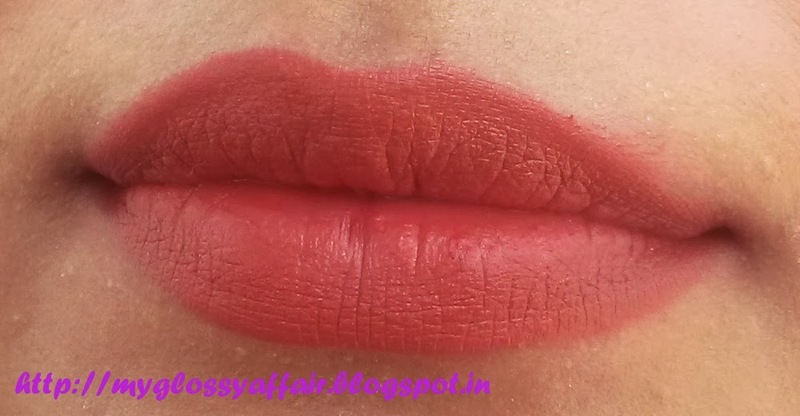 Very rich, creamy and pigmented matt lipstick. Suits Indian skin tones well. While it is matt, it causes no drying. A must buy and highly recommended. I will surely repurchase it.